Nagasaki Prefectural Hospital in Nagasaki. The hospital was founded in 1857 (Ansei 4) as Igaku Denshusho (医学伝習所) and was the first medical school in Japan. Over the years, the organization’s name, location and functions were changed repeatedly. During the 1860s, Dutch physician Pompe van Meedervoort lectured at this school on internal medicine and surgery. 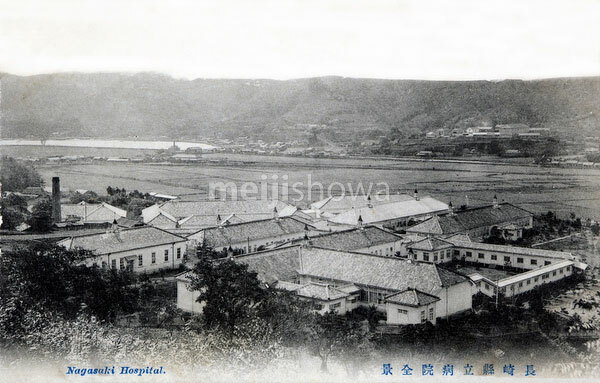 In 1902 (Meiji 35), the facilities moved to the location on this photo. The hospital is now called Nagasaki University Hospital and is still located on the same location.